Do you feel that you lack the expertise and experience to coach your staff through the Project-based learning process? We know you want achieve your vision for your school. In order to do that, you need the capacity to equip your staff. The problem is you aren’t equipped with project-based learning expertise or experience to coach your staff, which can leave you feeling overwhelmed. We believe it’s not fair for administrators to have to make this kind of transformational change on their own and without the help of support of someone with expertise in that area. We understand what it’s like to face the overwhelming task of implementing a new teaching strategy across an entire staff much less to do it effectively and as a result we’ve helped take schools and districts through the coaching process. Here’s how it works: Choose a Coaching Option. Work with a PBL Coach. Achieve your Vision. So, choose a coaching option today! So you can stop feeling defeated, and instead be empowered to fulfill your vision! Prior to Coaching, STAFF Attend a PBL Training. Attend our PBL Jumpstart at an Open Workshop or an On-Site Workshop and develop a foundation for implementing project-based learning. Once your school has chosen a coaching option (Tier 1, 2, or Face to Face) you will be paired up with your PBL Coach. You will meet either in person or virtually depending on your coaching contract. Based on your coaching contract, your staff will receive either ongoing (weekly or monthly) coaching support to address their PBL questions and need to knows. Your coach will work with you to form a customized plan to address you and your staffs specific need to knows. Your staff will have ongoing access to their coach. As you and your staff work with your PBL Coach, you'll be given instruction and guidance on how to deepen your understanding of project-based learning. You’ll also have access to PBL Web Sessions, which provide further support and training. The time you and your staff spend with your coach as well as the time invested in applying his/her feedback will help you and your staff to grow as PBL facilitators and improve your practice of project-based learning in the classroom and school. As you and staff work with your PBL Coach throughout the year, you’ll gain a growing ability to implement project-based learning with fidelity that results in improved student academic and life skills. As you and your staff implement PBL, you will have access to an "on call" experienced PBL facilitator. This means they can be reached at anytime by email, text, or a phone call. They will provide support and coaching for immediate need to knows or challenges that may arise in the day to day process of developing a PBL culture. You and your staff will have weekly virtual meetings with an experienced PBL facilitator to cover your progress in the PBL process as well as to answer need to knows. You can build your professional development around your specific PBL needs each week and have the guidance of a trained PBL facilitator to walk you through them. You and your staff will have yearly access to our PBL Web Sessions, which cover the basics of project-based learning. These web sessions cover standard need to knows we regularly encounter in our workshops with educators. You and your staff can move through them at your own pace. They provide specific action points as well as a variety of resources, including discussion questions, to extend PBL learning. 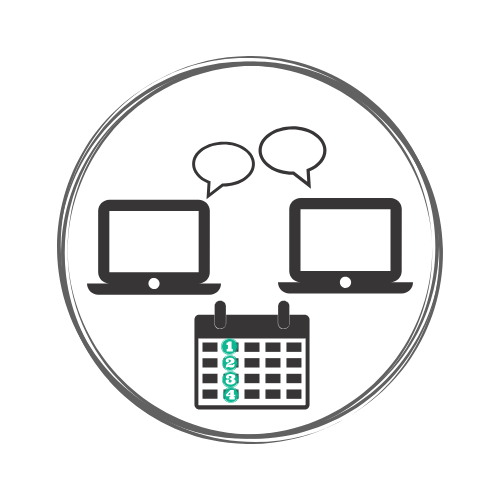 You and your staff will have monthly virtual sessions with an experienced PBL facilitator who will help you work through the challenges of implementation as well as answer need to knows that are developed over the course of each month. You can build monthly professional development around these meetings. You and your staff will have yearly access to our PBL Web Sessions, which cover the basics of project-based learning. These web sessions cover standard need to knows we regularly encounter in our workshops with educators. You and your staff can move through them at your own pace. They provide specific action points as well as a variety of resources, including discussion questions, to extend your PBL learning. — Citations: Joyce and Showers, 1996; Fouts, 2003; Stinnett and Zenger, 2007. Our customized days provide on-site experienced PBL facilitators who will work with you and your staff to address specific PBL needs and objectives. The day is tailored to address your need to knows or to implement specific training around school wide learning outcomes and initiatives. We craft a training session that is unique to you and your staff. *This option can be added to either of the two tiers.